Welcome to CSI Home and Commercial Services of Virginia! We specialize in providing customized Virginia pest control and weed control to homes in Fairfax, Manassas and Fredericksburg and surrounding communities. CSI also offers pest management solutions to businesses and industrial parks. Pest infestations can create serious health risks for families. Our home pest inspections locate termites, bed bugs, mice, ants, and several other common pests. Homes should be a safe haven from pest invasions. That’s why our trained professionals use the most effective pest control service treatment methods on the market. We eradicate existing infestations, and apply barriers around your home to repel pests. Our pest control treatments are safe and effective and can protect your home and yard from costly pest damage. 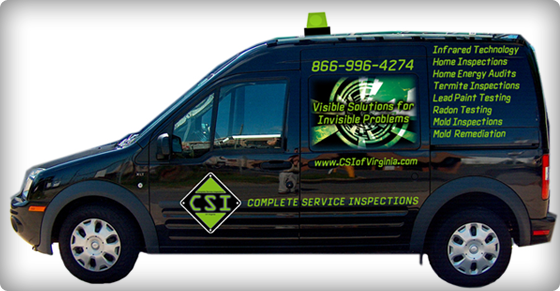 When you meet our courteous CSI of Virginia pest service technicians, you know you’re in good hands! CSI serves all of VA including but not limited to Fairfax, Manassas and Fredericksburg. As a trusted Virginia exterminator and pest control company, CSI of Virginia has the perfect solution for your individual needs. Pest problems come in a variety of situations. Termites eating away the inside of your house, bed bugs living in your bedroom, and raccoons destroying your attic are just a few examples of pest invasions. That’s why it’s so important to hire Virginia’s trusted exterminator! Our licensed technicians are trained to deal with every possible pest scenario, including cockroach control, rat trapping, millipedes, mosquito abatement, termite infestations, carpenter ants, raccoon, squirrels, opossums, bats, and more. We ensure that you are getting the best pest control service possible with a schedule that is customized to fit your needs. Our professional exterminators kill your pests, so that you can take care of more important things. CSI routinely trains its employees on the latest safety requirements in the pest control industry. They are licensed with the state and require each employee to take continuing education classes on a regular basis. CSI Home and Commercial Services offers exterminator programs and general pest services in Virginia. For Fredericksburg and Manassas pest control we can often offer same-day service. We are just around the corner! Commercial properties are especially vulnerable to pest infestations due to their size, high volume of visitors and their large spectrum of uses. Commercial pest management problems in a business can drive away clients and customers; and in some cases, a commercial food establishment can even have its license suspended. At CSI of Virginia, we understand the importance of keeping your business clear of pests. As an experienced provider of commercial pest control in Virginia, CSI delivers effective pest management programs which may use a combination of traps, baits, and pest barrier sprays to protect properties from invasive pests. We take care of your pests so that you can get back to business. Pest infestations often go unnoticed until they cause serious damage. Our goal is to help homeowners avoid costly repairs by finding pest problems. Effective pest control programs should begin with routine pest inspections to catch developing problems early on, which can minimizes potential damage. A pest inspection can inform a homeowner of the need for ant control, roach control or even a termite problem. We perform pest inspections in Fredericksburg, Fairfax, and Manassas Virginia (and surrounding areas). Our pest inspections not only detect current infestations, but also evaluate potential access points that pests may use to enter your home. Our professionals are trained to identify signs of termites, bed bugs, mice, rats, spiders, and ants so that they can consult with you on the best possible pest management solutions. Pest inspections from CSI of Virginia give you peace of mind regarding the security of your home. Termites are one of the most destructive pests in Virginia. A termite colony may cause undetected damage to your home for months. Termites live inside wooden beams, often within the structure of a home. We provide termite inspections in Virginia to locate hard-to-find termite colonies. Our termite inspection technicians are trained to look specifically for signs of termites and signs of termite damage. Finding a termite colony early on can save a homeowner thousands of dollars in repairs. We provide termite control in Fredericksburg, Fairfax, and Manassas (including surrounding cities and towns). If you are having an infestation, you need a termite control company that understands the intricate nature of many different species that can threaten your home. Effective termite service involves exterminating existing termite colonies and preventing future termites from accessing and damaging the home. The cheapest way to eliminate an infestation is by using termite baits. However, this does not always solve the problem. Chemicals may be used in a spot-treatment spraying method into the wood if the colony is small enough. Tenting and fumigating a home is also a very effective method for controlling termites. Tenting completely fumigates your home and eliminates all present pests, including termites. Regardless of the scope of your termite infestation, our professionals can find a termite solution for you. CSI is a top rated VA pest control service provider among all Virginia termite control companies! CSI Home and Commercial Services has been a trusted lawn care company in Virginia for decades. The moisture rich climate of Virginia gives lawn pests and weeds much more than a fighting chance at ruining beautifully landscaped turf. We offer regular services to not only control lawn pests and weeds, but our service is also a weed control prevention tool as well. Stop noxious weeds before they appear! CSI lawn care services include weed control, lawn fertilizing and lawn aeration. Just give us a call and ask how we can customize a lawn care service for your home or business grounds. We offer lawn care in Fredericksburg, Fairfax and Manassas Virginia (and surrounding areas). For lawn care and pest control in VA, call CSI today. CSI now offers over 10 different types of home inspections in Virginia. When it comes to inspections and pest control in VA, you name it, we cover it!!! Thanks to our high-powered technology, we can offer infrared scans accompanied by traditional inspection methods. We begin with a thorough infrared scan for concealed structural flaws, water damage, leaks in pipes, faulty wiring heat and energy loss, roof and ceiling problems, duct work problems, and termites or other pests. Once “suspicious” areas are identified by the infrared scan, we follow up with an in-depth visual inspection of the home. We pay special attention to the “suspicious” areas in order to determine the specific nature and cause of the problem. Finally, if the infrared scan detects signs of moisture pointing to termite activity, we employ high-tech sensors (patent pending) which can detect termite noises and pinpoint their exact location for treatment. Who Needs a CSI Home Inspection? Real estate purchasers can feel confident in their purchase decision with CSI’s HomeSafe home inspection. Our expert trained home inspectors put the latest technology to work when conducting a home inspections. This is most critical while conducting buyer’s due diligence before closing on the property and can save thousands of dollars in potential problems that can surface weeks, months or even years in the future. Contact us today to schedule your home inspection. Pest Inspections – We search your home for signs of current pest infestations. This thorough pest inspection includes spiders, ants, mice, rats, and other common pests. Pest inspections always precede pest control service program implementation. Our pest service is effective and thorough. Termite Inspections – Our termite professionals examine the wooden structures of your home for signs of termite damage. Termite inspections examine hard-to-reach areas of your home. your mattress, furniture, and carpet for signs of bed bugs and bed bug eggs. If your property shows signs of an infestation, in may be necessary to undergo a bed bug removal service program. Home Energy Audits – By examining the energy budget of your home, a home energy audit can determine areas of excess energy use. Lead Paint Inspections and Testing – Lead paint is a serious hazard for children, adults, and pets. An experienced and licensed home inspector will test your paint to measure the quantity of lead. Lead paint testing is necessary before any lead paint services can be recommended. Mold Inspections – Mold releases toxic spores into your home. During a CSI mold inspection, we inspect every inch of your home, including hard-to-reach spaces, for signs of mold. For pest control in VA, call today!